The Pilgrims, freshly debarked from the Mayflower in November of 1620, founded a colony in Plymouth, Massachusetts which became known as “America’s Hometown”. Five years later a woman named Grace Berry was buried in Plymouth. Her tombstone tells us that she was the wife of Thomas Berry and that she was about 58 years of age when she died on May 17, 1625. In 1630 the settlement of Boston began and accordingly, in 1659, a piece of land was designated as the North Burying Ground (Boston’s second cemetery) which later became known as Copp’s Hill. It is in this cemetery that Grace Berry’s tombstone rests today though accounts say she was originally buried Plymouth. As the legend goes her tombstone and presumably her remains were relocated from Plymouth to the Boston cemetery in 1659 when the cemetery first opened. Her slate tombstone is quite elaborate, and is carved with a coat of arms, cherubs and an angel and the inscription which is still very legible today. There is some controversy though. Why would her tombstone have been relocated to a cemetery 40 miles away which would have been a difficult journey at the time? 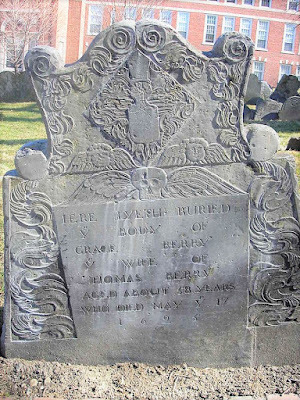 Many people believe that Grace Berry actually died in Boston in 1695. Accounts tell of a young boy named George Darracott, who changed the “9″ in the date of her death to a “2″ with his jackknife in the 1820s. It seems other tombstones were altered in that same fashion and he must have got caught in the act. However, there is the account of an older man who came to Copp’s Hill in July 1878 with his daughter and granddaughter looking for the final resting place of one of his ancestors. He had with him a notebook, yellowed with age, that bore a drawing of a tombstone with an accompanying inscription that exactly matched that of Grace Berry’s tombstone. Scribbled at the bottom of a page in the notebook was a footnote that indicated the date Grace’s tombstone had been moved from Plymouth to Boston. 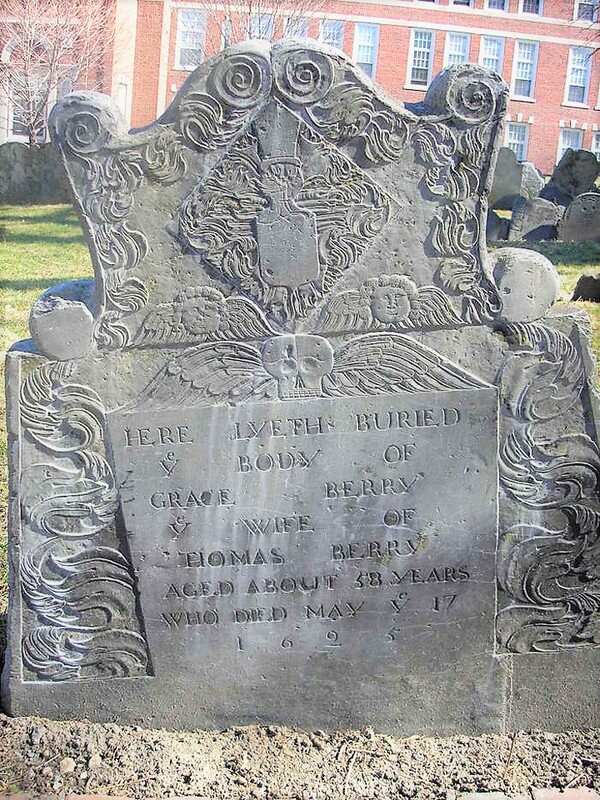 Another Account: Apparently it is that erected to the memory of Grace Berry, wife of Thomas Berry, who, according to the inscription, died May 17, 1625, or five years before Boston was settled. The stone is of old Welsh slate, well preserved and with the carving quite distinct; the edges are ornamented with curves and at the top are carved two cherubs and the angelof death. There is also cut a shield, without quartering of arms. The marks of British bullets are visible, this stone, like many others on the hill, having been a target for the British soldiers during the siege of Boston. Grace Berry, who was the daughter of Major John Jayman, a rope-maker, was living in the flesh with her husband, Thomas Berry, in their house near the Ship Tavern, at the junction of Ship (North) and Clark streets. Not matter what this will be researched as I am curious on this Berry line and more following later.